The Adjustable Shifter from Craven Speed for your R60 MINI Cooper and Cooper S Countryman is the only short shifter that gives you the option to set and re-set the shift length and height at any time. The biggest thing taking the fun out of the new Turbo MINI is the shifter feel. The stock shifter feels like I'm churning butter, it it just too soft and sloppy. 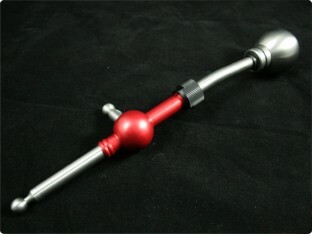 Replacing it with the Cravenspeed short shifter solves this and gives me that sporty feeling, but not being too hard. In a quick sprint, the less time you are on the clutch means more time on the gas. 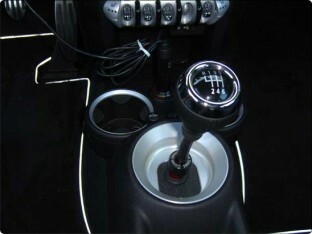 A short shifter is the only addition that will get you off the left pedal and onto the right. The thing is... you drive your car everyday, and you don't race everywhere you go. Having a shifter set to 50% of the stock throw will get you through the quarter mile quicker, but it will also be harder on you and your MINI. 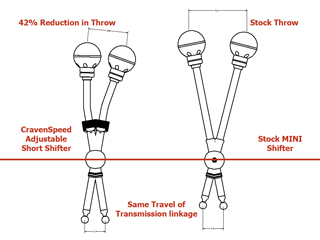 Short shifters take away the leverage the factory gave you in exchange for quicker, and more precise movements. Traffic is already the bane of standard transmission drivers; requiring extra leverage for every shift only makes it worse. With the Craven Speed Adjustable shifter you don't have to live with the disadvantages that accompany other short shifters; you set it where you want, when you want, without tools. 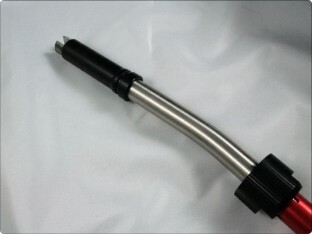 Hybrid designed and CNC machined from 1144 "Stress proof" black oxide steel and 6061 Aluminum; it is virtually unbreakable and infinitely adjustable from factory length to 200% shorter. With with our unique design, you cannot over adjust. The Craven Speed Shifter has a built in high and low stops so you don't even need to look to adjust it! This adjustable shifter is also great for the MINI owner with a spouse that doesn't like a short shifter. Since it can be adjusted in seconds, you can set it back up to stock position before your spouse drives it, that way they are never the wiser or complain about how hard your MINI is to drive. Stock knob adapter, to reuse your stock shift knob.